Torsten visited the Iziko South African Museum in Cape Town where 106 holotypes of southern African Mydidae and two of the three South African Apiocera are deposited. The images of type specimens that were taken will be of great help for identification of specimens that have been borrowed from numerous museum collections. Specimens for a morphological phylogeny of Apioceridae and Mydidae were also borrowed. Jason Londt from the Natal Museum in Pietermaritzburg (KwaZulu-Natal, South Africa) joined Torsten for field work in the Western and Northern Cape provinces. We visited quite a few type localities from which Mydidae species flying in the southern Hemisphere spring had been described, but were only able to collect 6 Mydidae species. Unfortunately, we didn't catch any of the more enigmatic genera like Agaperemius, Halterorchis, or Namadytes, which are known from this area. Numerous Asilidae species that are important for the REVSYS project were collected though. 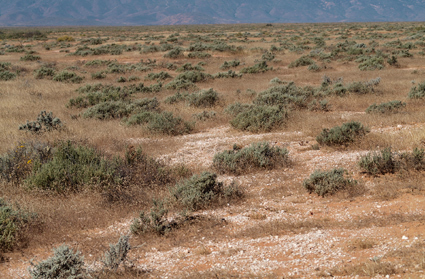 In particular, specimens of Acnephalum and Sisyrnodytes are very important to test the monophyly of the Willistonininae hypothesised by Torsten in 2009 to be a subfamily taxon known only from western North America and southern Africa (Sisyrnodytes does also occur in the Mediterranean). 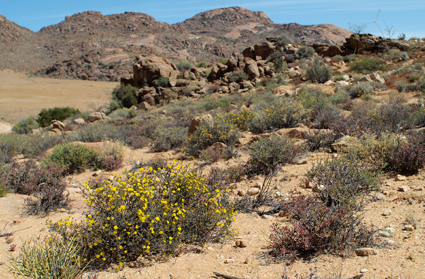 Habitat next to a dry river bed of the Droe River (near Vanrhynsdorp, Western Cape) where Arenomydas caerulescens (Mydidae: Syllegomydinae) was collected. 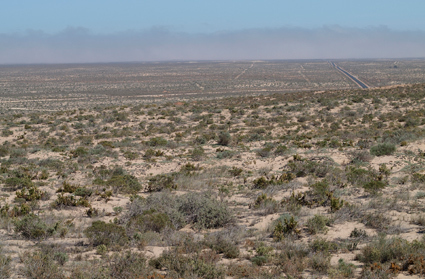 White, vegetated sand dunes 8 km E Port Nolloth (Northern Cape) where a Cephalocera species (Mydidae: Syllegomydinae) was collected. Note the wall of fog over the cold Benguela current in the distance. 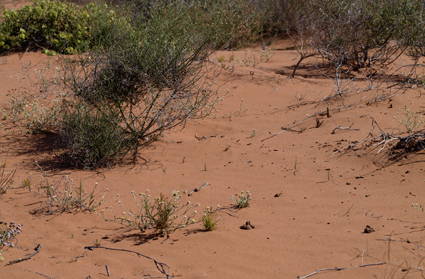 Red, vegetated sand dunes (near Klipheuwel, Western Cape) where Afroleptomydas opacicinctus (Mydidae: Syllegomydinae) was collected. Note the small flower in the foreground which was visited by the mydid on a few occasions. 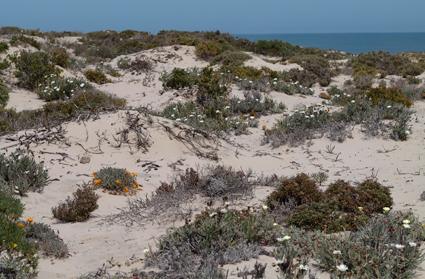 White, vegetated sand dunes at coast (McDougall’s Bay, Northern Cape) where Afroleptomydas consanguinensis (Mydidae: Syllegomydinae) was collected. The habitat in Goegap Nature Reserve (near Springbok, Northern Cape) looked great, but unfortunately we weren’t able to find any Mydidae during our visit. 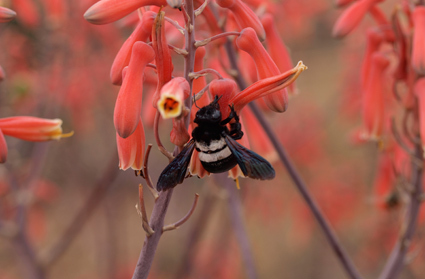 A Xylocopa carpenter bee on an Aloe species (Putsonderwater, Northern Cape). 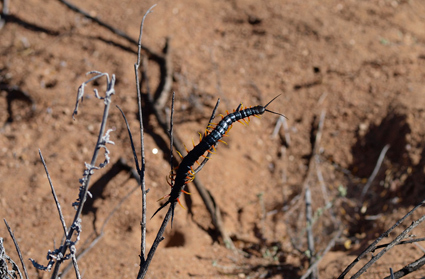 A large centipede (near Nababeep, Northern Cape). 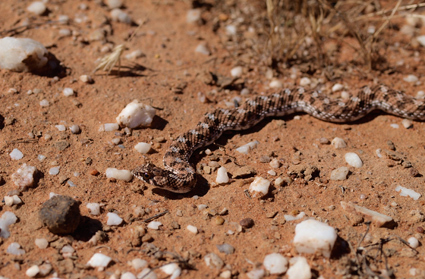 A rhombic egg-eater snake (Dasypeltis scabra) (Droe River, near Vanrhynsdorp, Western Cape).